Guava might not be as popular as other fruits, nevertheless, it is a fruit with a long list of benefits. If you want to stay healthy, it’s not just apple that you have to eat daily but you can have guavas too. Guava has been long known to contain anti-diabetic action. A recent study proved that guava juice can significantly lower the blood glucose levels. Besides lowering the glucose levels it is also effective in antagonizing the development of diabetes. Guava is rich in fibre, another reason why the fruit is excellent for diabetics. Its low glycemic index takes care that after eating the fruit blood glucose doesn’t shoot up. 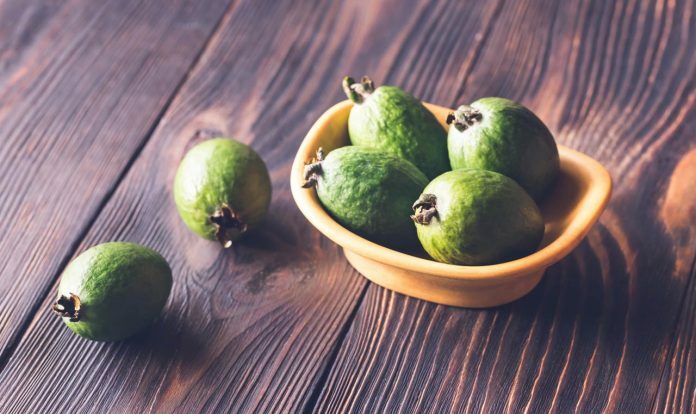 Guava also has anti-cancer properties which can be attributed to components such as quercetin, lycopene, and Vitamin C. All of them have anti-oxidant properties that take care of cancer causing free radicals. Regularly eating guava, thus, provides protection against cancer particularly breast, lungs, colon, skin and prostate. Guava is a good source of vitamin C (100g of guava has more than triple the recommended daily intake). Vitamin C in guava boosts your immunity and provides protection against various infective agents. Anti-inflammatory action of guava also accentuates immunity. Guava contains vitamin A, Vitamin C, lycopene & carotene. The free radicals are the culprits behind wrinkling and other aging effects on skin. The antioxidants in guava along with Vitamin A & C fight free radicals and keep the skin younger. Also, pink guava scrub can be used as scrub to improve skin complexion. The scrub removes the dead cells from the skin and rejuvenates it. The good amount of lycopene, an anti-oxidant ensures that your body fights off the damage from the UV rays and pollution. Guava has a wonderful effect on healing acne and lightening the dark spots. Apply the mashed guava paste on the affected areas daily for best results. Guava leaves scrub is also useful in in removal of blackheads. The scrub is also useful in alleviating allergies as they have potent anti-allergic action too. Study has shown that guava can improve the sodium and potassium balance in the body. This balance plays a significant role in the regulation of blood pressure. Also, guava can improve the levels of HDL (the good cholesterol) and reduce the levels of VLDL, LDL (bad cholesterols) and triglycerides. Overall, eat guava if you want to keep your heart healthy. Guava is also a good source of folic acid (Vitamin B9). Folic acid is required in new cell formation, a process that is at its peak during pregnancy (in developing the child). In fact, pregnant ladies are recommended folic acid supplements to safe their child from congenital deformities especially congenital neural defects. Guava is a good source of Vitamin A. If you’re not a big fan of carrots, guava might just be good for you. Now, I’m sure you already know what vitamin A does. It’s responsible for the formation of a pigment in the eyes, thus, improving the vision and keeping eyes healthy. Vitamin A deficiency leads to night blindness. 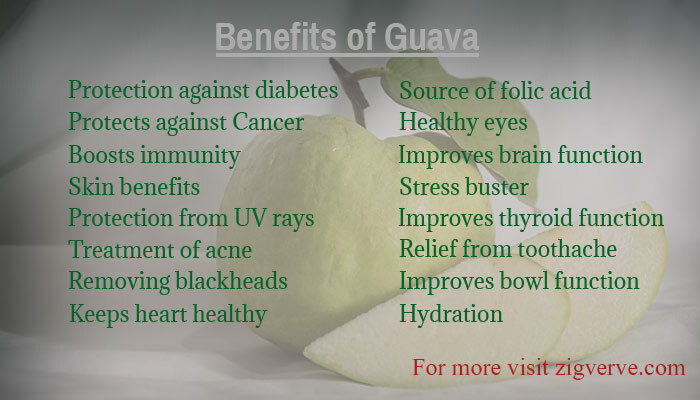 So eat a guava each day, if you want to be able to enjoy the night life. Brain is the CPU of a human body. If it’s not healthy, nothing in your body can function properly. Good news is that guava can help you keep your brain healthy. Guava has Vitamin B6 (pyridoxine) and Vitamin B3 (Niacin). These vitamins are responsible for keeping the blood circulation healthy thus improving brain blood circulation and, also, relaxing the nerves. Eat a guava and keep stress at bay. How? Guava contains magnesium which is responsible for relaxing nerves and muscles. Assuming how life these days is so stressed eating guava can certainly be the right thing to do. Thyroid glands secrete thyroxin, an important hormone for various body functions. Guava has a trace element copper in them, which can improve thyroid function. Until now we have talked about the fruit, however, guava leaves can be beneficial too. The leaves have decent anti-inflammatory properties, along with some healing and antimicrobial action too. These properties make them good home remedy for toothache. The rich fibre content in guava ensures that the digestive system remains at its best. Daily eating a guava fruit would improve the bowel movements and thus alleviate constipation. Guava has more than 80% water. That makes it a good source of water too. Now, I don’t have to tell you that water is vital for all body function and skin health. Having guava thus provides a good amount of water while making you feel full. It improves the body hydration, particularly skin hydration.